We've certainly got plenty to look at in coming days, but perhaps a good place to start is with a review of some of the latest COTs, because of their implications for the immediate future. The following charts make very clear why those in control of publishing COT data hold up its release for three days (the data is always for Tuesday's close) so that those at the top of the food chain can position themselves comfortably to benefit from early knowledge of what's going on before the ordinary shmuck does—observe how the uptrends in both copper and the broad market S&P 500 index presaged by the COTs have already started by the end of the week. In looking at the charts, keep in mind that markets were closed on Friday. 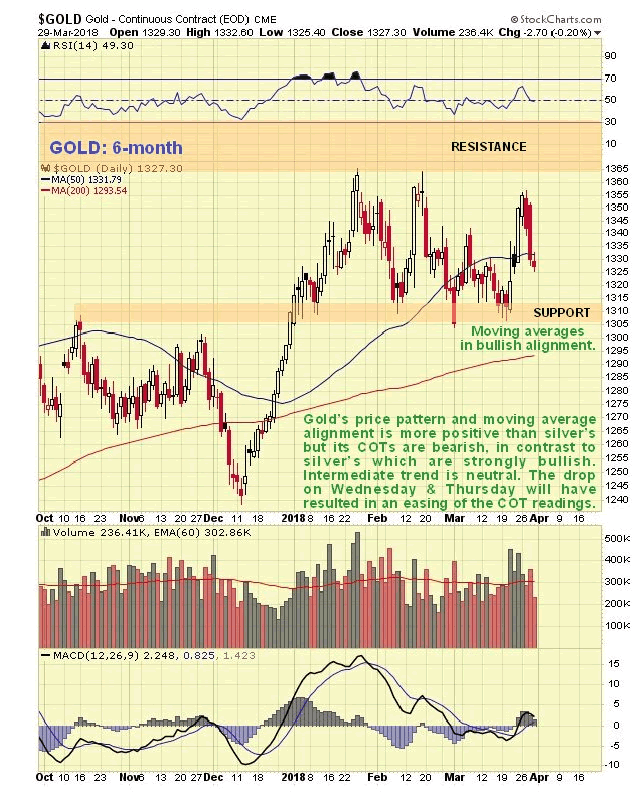 Short-term trend in gold is down, intermediate trend neutral, with long-term outlook very positive. On its latest 6-month chart we can that it has backed off again from resistance, this time from a slightly lower level, with the retreat predicated by the now bearish COTs, or rather it would be if it didn’t take three days for this information to be made public. 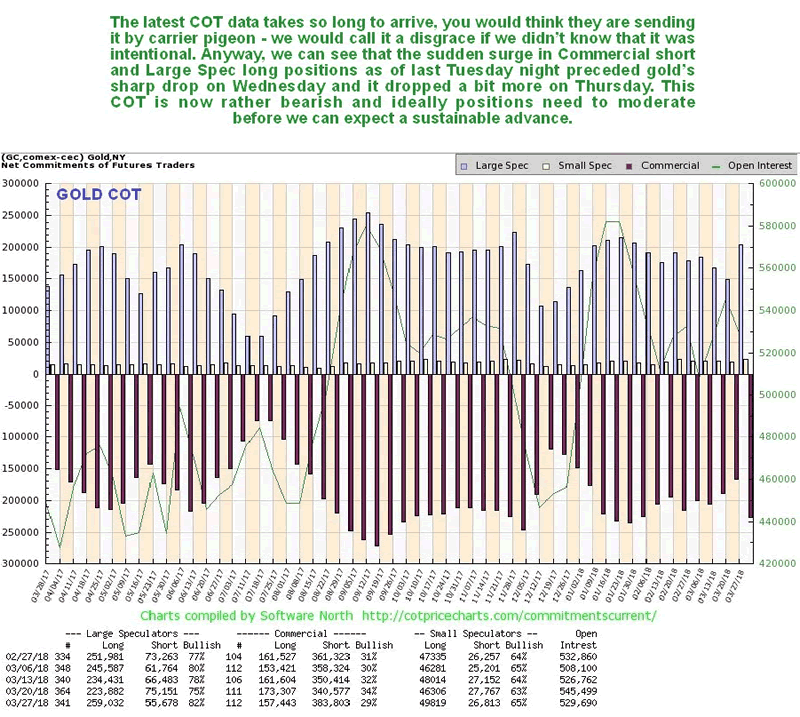 Taking into account that the COT probably eased on Wednesday's and Thursday's drop, further short-term weakness look likely until this COT has moderated. Click on chart to pop-up a larger, clearer version. 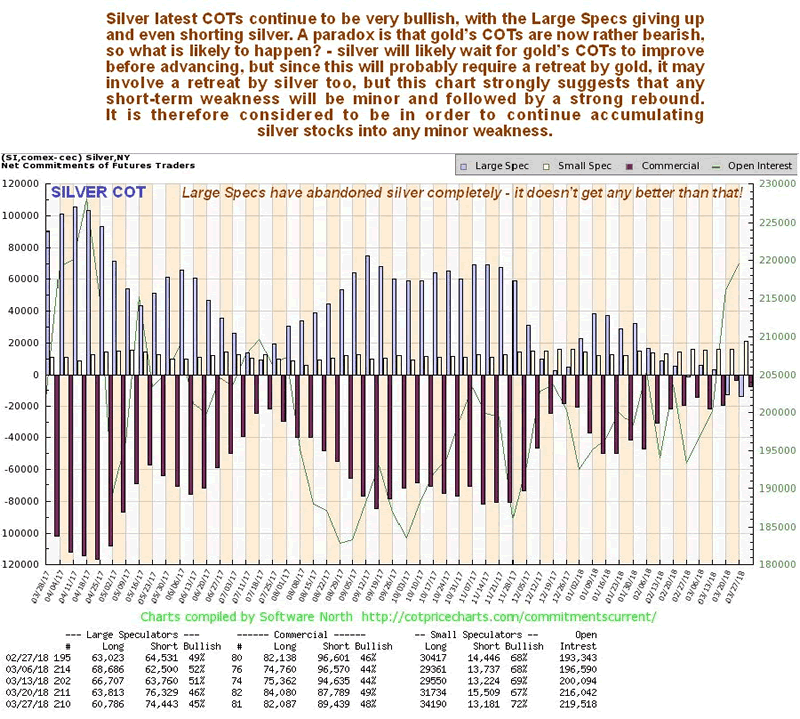 Silver's price pattern looks less positive than gold's, but its latest COTs look flat out bullish, with the habitually wrong Large Specs having given up on silver completely and now shorting it, which is something we have never seen throughout the history of the site. This is viewed as being very bullish indeed. Even so, silver will probably have to wait for gold to sort itself out before it can mount a significant rally, since it is unlikely to rise by itself while gold languishes. 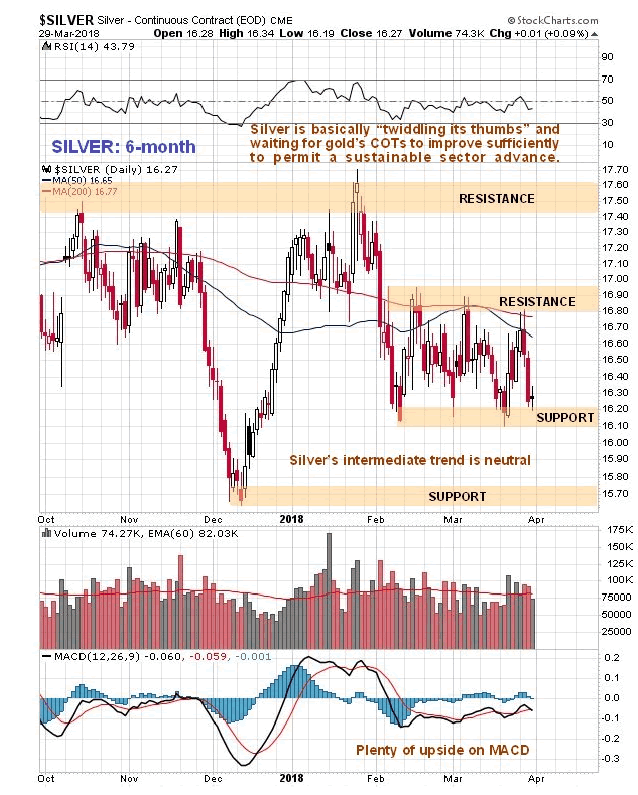 Continued near-term weakness will be viewed as an opportunity to build positions further in silver investments. The latest silver COTs are so bullish that even if silver does drop in sympathy with gold, it is unlikely to be by much. Click on chart to pop-up a larger, clearer version. 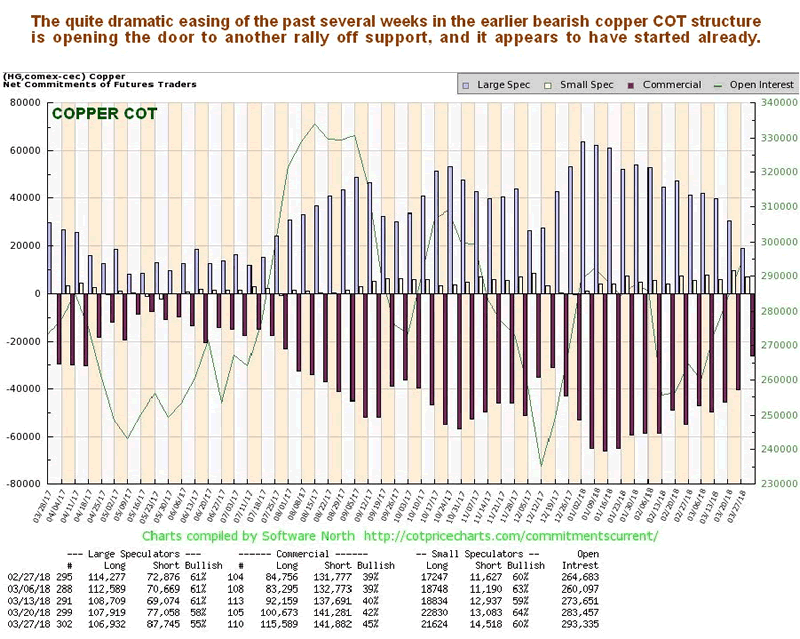 It's also worth taking a brief look at copper and its COTs because of its implications for metals markets generally. 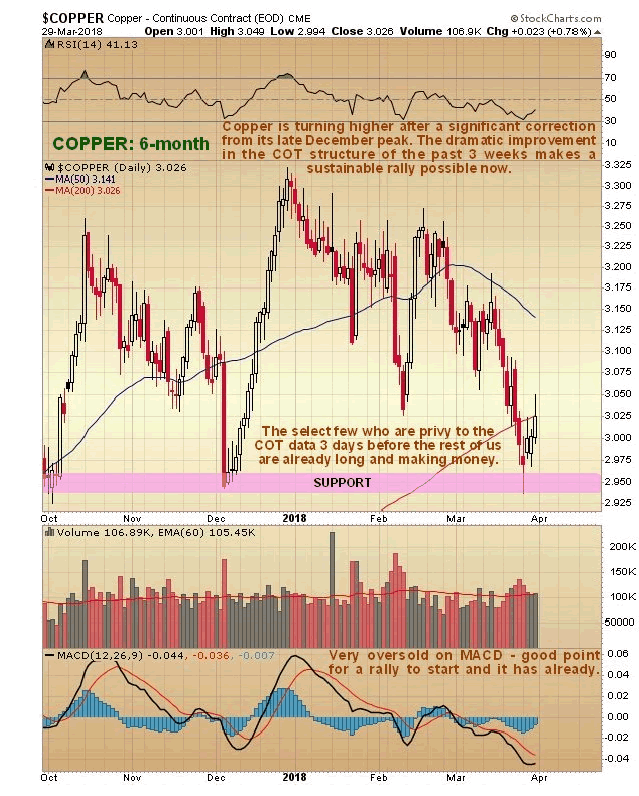 Copper's COT has been decidedly bearish for some time, and it is thus not surprising that the price has dropped back from its December high. However, as it arrived back at an important support level last week, its COTs eased right back from earlier bearish readings to levels that permit copper to turn higher again, and that's what happened last week with another rally starting. With the price near to a still rising 200-day moving average, this rally is believed to have legs and should carry further. Click on chart to pop-up a larger, clearer version. 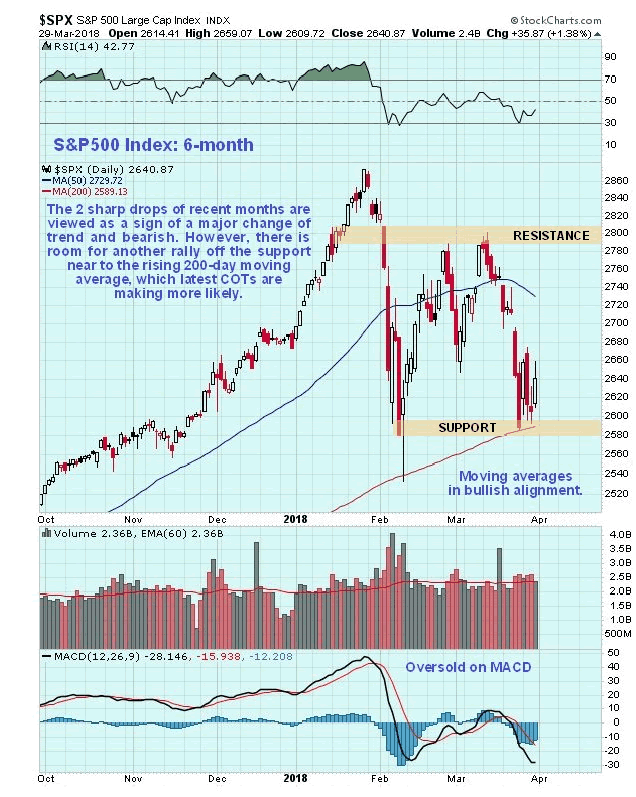 The broad stock market picked up on Friday and advanced off significant support near to its rising 200-day moving average, where a small base pattern formed over the past week. Overall the pattern is viewed as bearish with the two sharp drops so far this year regarded as a warning. However, it is entitled to rally off this support towards its March highs, although it is quite likely that it will turn lower again before it gets to them. 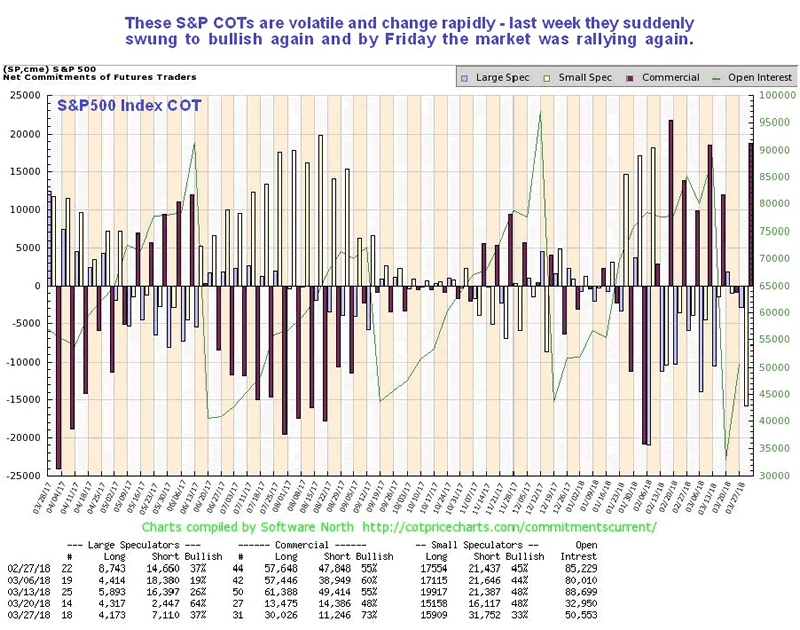 Latest COTs quite came in bullish and support the rally scenario, although we should note that these S&P500 index COTs are volatile and can change tack very quickly. The above represents the opinion and analysis of Mr Maund, based on data available to him, at the time of writing. Mr. Maund's opinions are his own, and are not a recommendation or an offer to buy or sell securities. Mr. Maund is an independent analyst who receives no compensation of any kind from any groups, individuals or corporations mentioned in his reports. As trading and investing in any financial markets may involve serious risk of loss, Mr. Maund recommends that you consult with a qualified investment advisor, one licensed by appropriate regulatory agencies in your legal jurisdiction and do your own due diligence and research when making any kind of a transaction with financial ramifications. Although a qualified and experienced stoc kmarket analyst, Clive Maund is not a Registered Securities Advisor. Therefore Mr. Maund's opinions on the market and stocks can only be construed as a solicitation to buy and sell securities when they are subject to the prior approval and endorsement of a Registered Securities Advisor operating in accordance with the appropriate regulations in your area of jurisdiction.